This year is the first year I have ever missed a holiday. As the prideful traditional type, I felt a sense of shock when I didn’t immediately want to go home for the weekend. I had to make the adult decision of putting other things in front of my work. I have two test and two presentations to prepare for the week following easter. I also am surprising my best friend for her college graduation along with her birthday. For my college edition Easter I still wanted to honor my traditions. Going to church, having brunch and finishing it off with a home cooked meal. It isn’t a holiday unless I have my grandmas corn. It may sound plain but there is so much love that she puts into it. It also isn’t a holiday if you don’t have mashed potatoes. I went to the store and face-timed my grandma to make sure what I was getting was exactly the same thing she gets. I brought it over to my friends apartment and we made food. I also had to face-time my grandma to make sure I made everything right! After cooking on the stove we went upstairs to grill. Once all of our food was ready we both agreed… there wasn’t the home cooking love in our dishes. Don’t get me wrong though, the food was still amazing. I just hope that next year I can have my grandmas corn! After a long night traveling my family and I made it to San Francisco. After getting our rental car we headed to fisherman’s wharf. We wanted to be close to Pier 33 for our alcatraz tour. On our way we drove right by Lombard St. Lombard street is famously known for the steep twisty road. I knew we had to stop and walk up. Although all of the flowers were not in bloom it was still gorgeous. The view from the top was insane. After eating lunch at a Louisiana, Mardi Gras themed restaurant at Pier 33, we hopped on a boat to Alcatraz Prison. I had never knew much about this prison, just the basics. It was on an island and it was meant for the worst criminals from 1930’s to 1960’s. We had bought the tickets a couple days in advance because it sells out days in advance. Not only were the views from Alcatraz insane, so was the history. When we arrived on the island we walked up to the top where the cells were. That was where you started the tour. When you purchase the boat ticket, you are also purchasing a headset tour. The headset tour gave an amazing insight on what it was like when the prison was open. The guides featured prison guards and even prisoners. We walked around the sells, the dining hall, the library, and much more. Due to lack of time we weren’t able to explore the whole island. The island is now a state park and it features gardens. The first thing that comes to mind when I think of San Francisco is, the Golden Gate Bridge. I knew if there was one thing I needed to visit, it was the Golden Gate Bridge. When we put it in the maps it took us to the the Vista Point lookout. The look out is right when you get off of bridge. The view from the lookout point was not what I expected. It was overly crowded and you couldn’t get a side view of the bridge. We got back in the car on a mission to find a better view of the whole bridge. From the pictures, you can definitely tell we found an incredibly breathtaking view. When we got back on the 101 we got off on Alexander Ave then turned onto Conzelman Rd. On the side of the road there were spots to park on the side of the mountain. We drove to the second little parking spot and found the perfect view of the Golden Gate Bridge. After having an impromptu photoshoot we worked up an appetite. For dinner we ate at The Stinking Rose. The restaurant is famously known for their use of garlic. All of their food was drenched in garlic. We weren’t going anywhere after so it was totally fine with me! I ordered the buttered noodles and they were amazing! It was a perfect way to end the day in San Francisco. 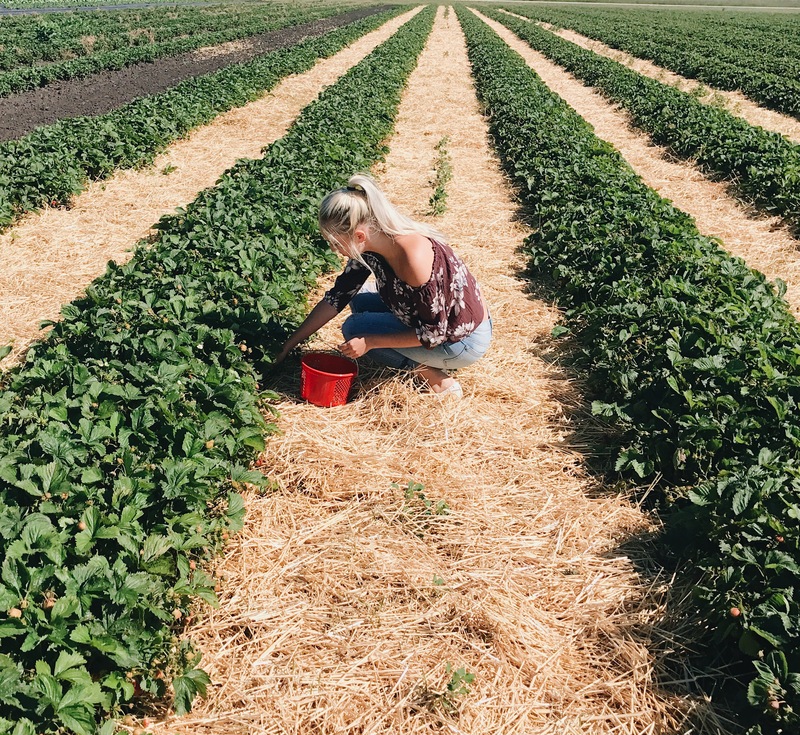 Today at a local berry farm it was the first day of strawberry picking season! 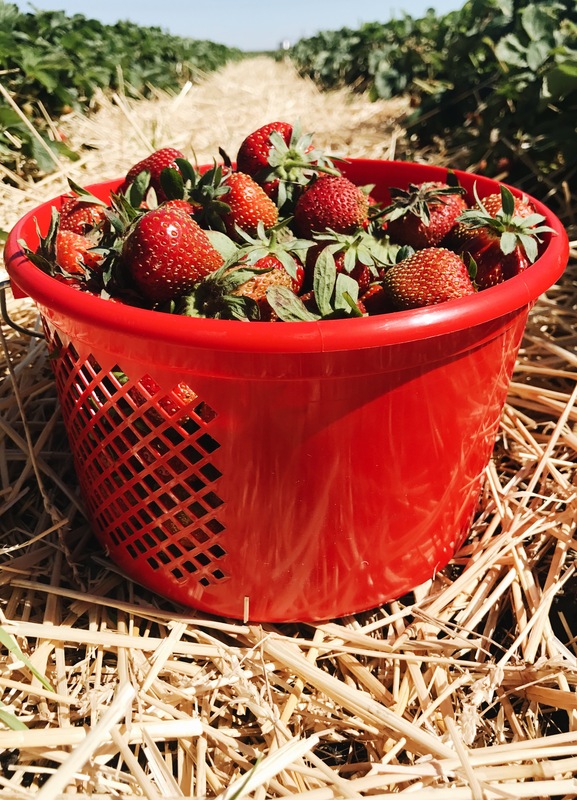 I went with my friend Abby to the farm to pick a bucket full of strawberries! It only cost $12 (almost $2-$2.40 a pound) for a bucket filled with 5-6 pounds of strawberries! I had seen on Facebook that today was the first day and knew I had to go! When we got back from the berry farm we had so many red (on the inside too, normally they are almost white when bought at the store) juicy flavorful strawberries we had no idea what to do with! We decided to make strawberry muffins, such a good decision! 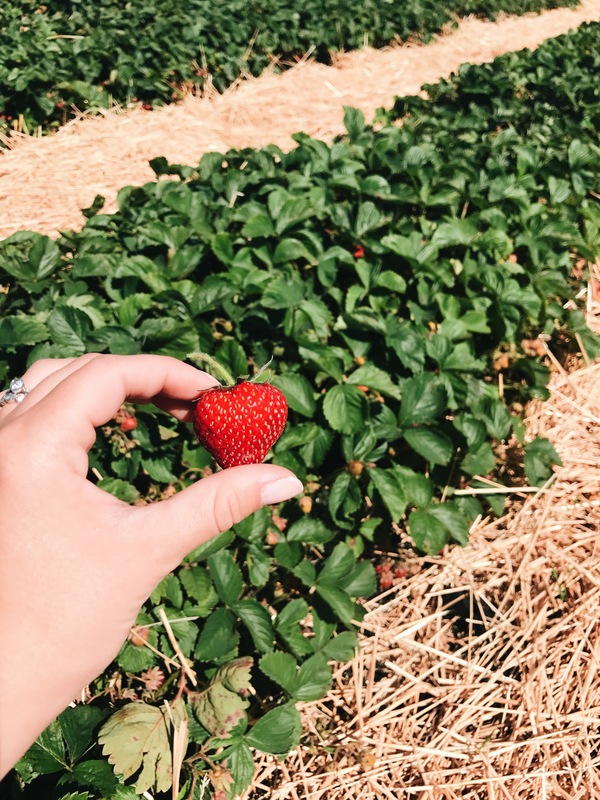 If you have the chance to go to a berry farm definitely go! The strawberries taste so much better than the ones you would get from the store!! Over my spring break I went on a cruise through the Caribbean! Cruises are an amazing way to see the beauty around the world. The first day we set sail to Key West. Key West is the most southern point in the United States. It’s only 98 miles to Cuba. In Key West I took a tour around the town and I learned so much! The city has no natural beaches because there is a reef that acts as a natural barrier that protects the Keys. After our day at the Key West we set sail around 4:30. On the second day we were at sea. During the sea day I spent the whole day soaking up the sun. It was so hot outside but on the boat there was a perfect breeze. With the breeze I was unable to feel how much sun I was actually getting, I ended up getting a pretty bad sunburn on my back. Sea day is also formal night in the dining room. Being for the most part vegetarian there wasn’t many dinning room options for me. I had a lot of fries this week. The third day was our second stop, Amber Cove, Dominican Republic. When I woke up and looked over the balcony I almost cried. The view of the Dominican Republic from the boat was so gorgeous. I could not believe how breathtaking it was, and pictures do not do it justice at all. When we got off the boat we just walked around the little shopping area. There was also a decent sized swimming area for everyone with a bar and restaurant. They also had a 360 bar that you could walk up to. Walking up to the bar was the highlight over Amber Cove. That is where you could see everything. It was so heartbreaking to leave because it was so beautiful there. The fourth day we went to Grand Turk, Turks and Caicos. In Turks and Caicos we did an excursion, the excursion took us to the other side of the island to the Bajrai Beach Escape. Here there was just the crystal clear waters and clear beaches. There weren’t as many people here which made it 10x better. At this place they had music, drinks, food, and rental water gear. I decided to face my fear of fish and go snorkeling. I thought it was the perfect time to do it, thankfully there were not many fish in sight. The water was perfect, it’s just how you would imagine in the pictures. It was hard to get back on the boat after being in paradise. The fifth day we were at sea again. During this sea day I laid in the sun again, after being burnt from the first sea day I was finally able to lay out in the sun again. One of my favorite places to visit on the ship was the Exploration Cafe. They had the best cookies and my favorite, macaroons! I think on this day I ate three to four cups of fries.. with no shame. The sixth day we stopped at a private island, owned by the cruise ship line, Half Moon Caye, Bahamas. This place was also breathtaking. It was almost like Turks and Caicos but a lot cleaner and nicer because nobody lives on the island except for 12 workers. At Half Moon Cay we did a glass boat bottom excursion. During the excursion we learned a lot about the caribbean ocean life and the island. I got a lot of cool GoPro footage underwater of fish and so many jellyfish! After the boat ride was over we got to eat a BBQ lunch or for me a fruit and vegetable lunch. After lunch we headed over to the beach where we relaxed for a couple of hours until we had to get back onto the ship. The ocean front that had all the beach chairs went on for, my guess, over a mile at least. I decided to go walk the beach, get more gopro footage, and relax by the water. The best part was that there was nobody around. It was like I had my own private island. After spending a half hour exploring I headed back to the beach chairs. When I got back I decided I wanted to rent a flat raft so I could lay on it in the ocean. When I went to the rental hut they just let me take it instead of paying the $5! It made the relaxation even more enjoyable. Around 3:30 we said our sad goodbyes, headed back to the ship and set sail back to the United States. Every destination exceeded my expectations. I cannot even choose a favorite, each one was gorgeous in their own way. My week of relaxation in the Caribbean was a success! Click Here to check out my video!!! Comment on the video if you enjoyed! Click Here to check out my video! Comment on it and tell me what you think! Starting out our day we got off the boat and headed straight to the train station. The train took us into the heart of Rome. The first stop we took was to see the Vatican. It was one of the most interesting buildings I have ever been in. With handpainted walls and ceilings that are centuries old. Although for having a limited time in Rome it took up the majority of our time. We spent a solid 2 hours inside, with no air conditioning in the heat of the summer. After visiting the Vatican we headed over to a huge disappointment. We went to see the gorgeous Trevi Fountain. Unfortunately it was under construction. The whole fountain was drained and covered. We proceed to find a spot to eat lunch. For the first time I had authentic Italian food! After lunch we decided to explore the city! We walked to the streets and we visited the spanish steps! I am bummed because we didn’t reach the colosseum which was probably something I was most excited for. Although I did take some awesome pictures whilst enjoying the perfect streets of Rome. We then made it full circle back to the train station and got on the train for our hour journey back to the boat. Arriving in Barcelona I didn’t know what to expect. After traveling all night I was exhausted but that didn’t stop me! We got to the hotel and changed into fresh clothes and went straight to town! We decided to walk the streets of Barcelona. The hotel we stayed at was The Hotel Royal on La Rambla street. La Rambla street was pretty neat! There were a ton of vendors technically in the middle of the road. The roads were divided by a walkway I guess you could call it. We walked all the way to the Casa Batlló. After walking to the Casa Batlló we decided to grab lunch. We decided to have tapas from Trotamundo Tapas. Over lunch we decided it would be best if we got on a “hop on hop off bus” instead of walking. It was a great decision considering we only had a limited amount of time until we had to leave for the cruise ship. On the tour we saw so many different things! We first stopped at the Museu Nacional d’Art de Catalunya and it had the most amazing view of Barcelona! We also got to see La Sagrada Familia, which is still under construction and has been for the last 131 years. The we also went to Castell de Montjuic which was a castle and it had an amazing view of Barcelona as well! On this day we walked around and did a little shopping. We went shopping at the famous Desigual. The store wasn’t really my type of clothing store but it was very interesting and my mom seemed to love it! I had to go inside a few other stores, I bought a pair of pants at a store called _____ and I am obsessed with them! After shopping in the clothing stores we decided to walk down La Romblas. Whilst walking we discovered The Mercat de la Boqueria of Barcelona. There were so many different things inside. I have never seen such a thing. It is basically like an outdoor super market. There was fish, meats, and candy being sold there. For lunch it was a very excited time for me. I had my first Margarita!!! I am 18 years old and that is the legal drinking age in Europe so I thought why not obey the law!